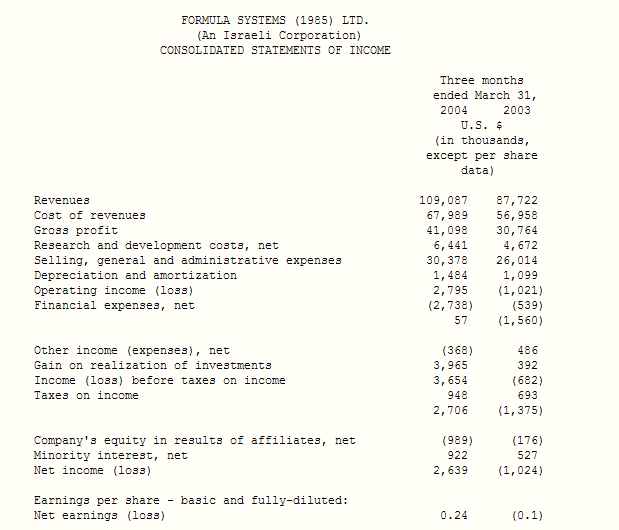 HERZLIYA, Israel, May 30 /PRNewswire-FirstCall/ -- Formula Systems (1985) Ltd. (Nasdaq: FORTY - News) a leading provider of information technology products, solutions and services, announced today results for the first quarter ending March 31, 2004. Revenues for the first quarter ended March 31, 2004 were $109.1 million, an increase of 24% from $87.7 million in the comparable quarter of 2003. In the first quarter of 2004 Formula acquired 59% of Formula Vision Technologies (F.V.T) ordinary shares by way of private placement and has begun to consolidate Formula Vision's results. 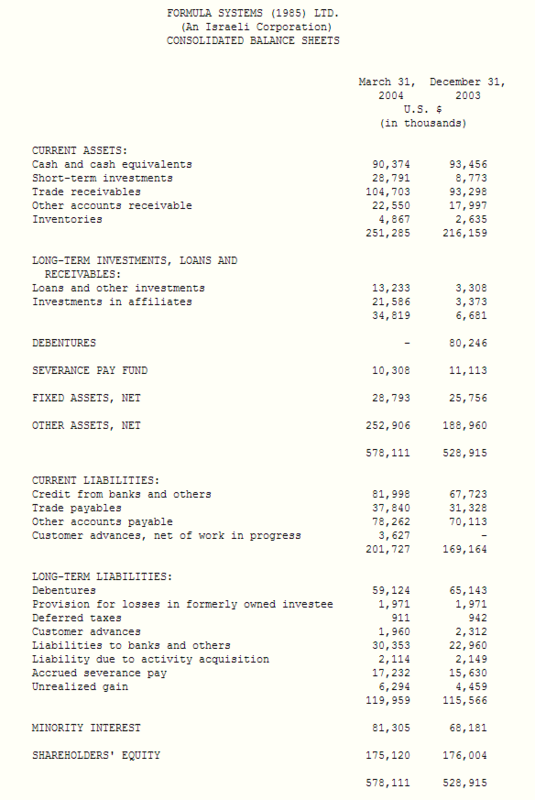 Net income in the first quarter of 2004 totaled $2.6 million or $0.24 per share as compared to a net loss of $1.0 million or ($0.1) per share in the first quarter of 2003. "I am encouraged by our achievements in the first quarter, said Gad Goldstein, President of Formula. "Our aggregate revenues in this quarter, including consolidated companies and companies on which we have material influence, reached approximately $123 million. We believe that during 2004 we will pass the significant milestone of 0.5 billion dollars in aggregate revenues. Improvement in the results of all of our major subsidiaries contributed to the significant increase in all of our consolidated operating parameters, as compared to the first quarter of 2003." Mr. Goldstein added: "The Company and some of our subsidiaries have raised over $15 million during the first quarter of 2004 by selling shares, private placements and issuance of convertible debentures, thus continuing the trend that started in the fourth quarter of 2003 to improve the liquidity and capital resources in the Formula Group. During the coming year we expect additional transactions that will further enhance the Group's liquidity and capital resources." Mr. Goldstein concluded: "I believe that the combination of improvement in the operating results of our core companies together with value enhancement activities carried out by Formula Vision in its holdings, are a solid starting point for a good year."